Kiyomizu Rokubei VI (1901-1980). Mizusashi (water jar) with floral patterning of an ebine (calanthe orchid) and lacquer lid. Japan, circa 1978. 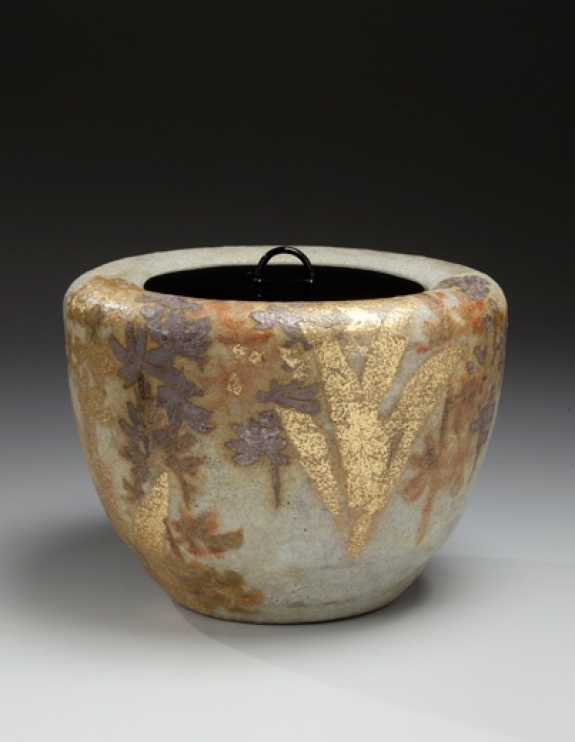 Kokisai-glazed stoneware with gold and silver. 6.38 x 8.5 inches (16.2 x 21.6 cm). Courtesy of Joan B. Mirviss Ltd.
Asia Week New York, which ran from March 10-19 this year, garnered $130 million during its ten-day run. Among the 45 participating galleries were Erik Thomsen Gallery and Joan Mirviss, who sold ninety-five percent of the works on view in the exhibition A Palette for Genius: Japanese Water Jars for the Tea Ceremony.